Outkast is an American hip-hop duo from Atlanta, Georgia, United States. The duo is one of the most successful hip-hop groups of all time, having received six Grammy Awards. Over 25 million copies have been sold of Outkast's seven releases: six studio albums?including one double album?and a greatest hits release. The group's original musical style was a mixture of Dirty South and G-Funk. Since then funk, soul, pop, electronic music, rock, spoken word poetry, jazz, and blues have been added to the group's musical palette. The group's original musical style was a mixture of Dirty South and G-Funk. Since then funk, soul, pop, electronic music, rock, spoken word poetry, jazz, and blues have been added to the group's musical palette. The duo consists of Atlanta native Andr? "Andre 3000" Benjamin (formerly known as Dr?) and Georgia-born Antwan "Big Boi" Patton. Speakerboxxx/The Love Below is one of only four hip-hop albums to be certified Diamond in the U.S. for shipping over 10 million units. Along with Outkast's commercial success, they have maintained an experimental approach in their music and are widely praised for their originality and artistic content. Benjamin and Patton met while attending Tri-Cities High School, a Visual and Performing Arts School. Benjamin's parents were divorced and he was living with his father. Meanwhile, Patton had to move with his four brothers and six sisters from Savannah to Atlanta. Benjamin and Patton eventually teamed up and were pursued by Organized Noize, a group of local producers who would later make hits for TLC. The duo initially wanted to be called "2 Shades Deep" or "The Misfits", but because those names were already taken they later decided to use "OutKast" based on finding "outcast" as synonym for "misfit" in a dictionary. OutKast, Organized Noize, and schoolmates Goodie Mob formed the nucleus of the Dungeon Family organization. OutKast signed to LaFace Records in 1992, becoming the label's first hip hop act and making their first appearance on the remix of label mate TLC's "What About Your Friends". In 1993, they released their first single, "Player's Ball". The song's funky style, much of it accomplished with live instrumentation, was a hit with audiences. "Player's Ball" hit number-one on the Billboard Hot Rap Tracks chart. Their debut album, Southernplayalisticadillacmuzik, was issued on April 26th, 1994. This initial effort is credited with laying the foundation for southern hip hop and is considered a classic by many hip hop aficionados. Every track on Southernplayalisticadillacmuzik was produced by Organized Noize and featured other members of the Dungeon Family. Follow-up singles included the title track and "Git Up Git Out", a politically charged collaboration with Goodie Mob that was later sampled by Macy Gray for her 1999 hit "Do Something." On this early material, both Andr? and Big Boi contrast lyrical content reflecting the lifestyles of pimps and gangsters with politically conscious material commenting on the status of African Americans in the South. OutKast won Best New Rap Group at the Source Awards in 1995. In the same year, the group contributed "Benz or a Beamer" to the popular New Jersey Drive soundtrack. ATLiens was OutKast's second album, released on August 27th, 1996. The album exhibited more self-consciousness, and further solidified OutKast as the flagship representatives of the 1st generation Dungeon Family and the Southern hip hop movement. The album helped the group earn more recognition among East Coast hip hop fans in the East and West coasts. For this album, OutKast joined with partner David "Mr. DJ" Sheats to form the Earthtone III production company, which allowed the group to produce some of their own tracks. "ATLiens" was the group's second Top 40 single (following "Player's Ball" from their first album), and reflected the beginning of Andr? 's increasingly sober lifestyle: "No drugs or alcohol/so I can get the signal clear," he rhymes about himself. "Elevators (Me & You)," OutKast's first self-produced single, became the group's first Top 20 hit the same year. OutKast's third album Aquemini was released on September 29, 1998 and also reached the number-two position on the Billboard 200 album chart in the United States; its title was a combination of the zodiac signs of Big Boi (an Aquarius) and Andr? (a Gemini). The album was widely praised as possibly the group's best material to date: when reviewed by popular hip-hop publication The Source, it received the much-coveted "5 Mics" (out of five) rating. Producing more material themselves, both Big Boi and Andr? explored more eclectic subject matter, delving into sounds inspired by soul, trip hop, and electro music. The album featured production by Organized Noize and collaborations with Raekwon, funk pioneer and musical forebear George Clinton, and Goodie Mob. In 1999, OutKast and LaFace Records were sued by Rosa Parks over the album's most successful radio single, which bore Parks' name as its title. The lawsuit alleged that the song misappropriated Parks' name, and also objected to some of the song's obscene language. The song's lyrics were largely unrelated to Parks, save for a line in the chorus: "Ah ha, hush that fuss / Everybody move to the back of the bus". The song, which OutKast maintained was intended partly as homage, only refers to Parks as a metaphor: the purpose of the song's chorus is to imply that OutKast is overturning hip hop's old order, that people should make way for a new style and sound. The initial lawsuit was dismissed. Parks' representation hired lawyer Johnnie Cochran to appeal the decision in 2001, but the appeal was denied on First Amendment grounds. In 2003, the Supreme Court allowed Parks' lawyers to proceed with the lawsuit. In 2004, the judge in the case appointed an impartial representative for Parks after her family expressed concerns that her caretakers and her lawyers were pursuing the case based on their own financial interest. Later that same year, the members of OutKast were dropped as co-defendants, and Parks' lawyers continued to seek action against LaFace and parent company BMG. In 2003 Andr? told UK journalist Angus Batey that, following a Detroit concert in the midst of the legal battle, relatives of Parks had approached him and implied that the case was less to do with Rosa than with the lawyers. The suit was finally settled on April 14, 2005, with neither OutKast nor their label having to admit any wrongdoing. The group did, however, have to agree to perform some sort of tribute to Parks. Originally titled "Sandbox", the pair's fourth album, "Stankonia", was released in October 2000 to excellent reviews. It debuted at number two on the Billboard 200 in the U.S., and would eventually be certified quadruple-platinum. Stankonia's first single was "B.O.B. (Bombs Over Baghdad)", a high-tempo jungle-influenced record. The second single, "Ms. Jackson," combined a pop hook with lyrics about divorce and relationship breakups, particularly Andr? 's breakup with singer Erykah Badu; the titular "Ms. Jackson" character being a doppelg?nger for Badu's mother. It was at this time that Andr? changed his stage name to the current "Andr? 3000". The single became their first pop hit, landing the number-one position on the Billboard Hot 100 chart, and the number-two position on the UK Singles Chart. The album's final single was the Organized Noize-produced "So Fresh, So Clean", featuring a credited guest appearance from regular guest vocalist and Organized Noize-member Sleepy Brown and garnered a remix featuring Snoop Dogg. All three singles' videos had heavy MTV2 airplay, and Outkast won two 2001 Grammy Awards, one for Best Rap Performance by a Duo or Group for "Ms. Jackson", and another for Stankonia as Best Rap Album. During the recording of Stankonia, OutKast and Mr. DJ began producing tracks for the artists on their Aquemini Records imprint through Columbia, including Slimm Cutta Calhoun and Killer Mike, who made his debut on Stankonia's "Snappin' & Trappin." Webzine Pitchforkmedia.com named Stankonia the 4th greatest album released between 2000 and 2004 in its 2005 feature. In 2009, B.O.B. was chosen as the number one song of the decade. In December 2001, OutKast released a greatest hits album, Big Boi and Dre Present...OutKast, which also contained three new tracks. One of these new tracks was the single "The Whole World," which won a 2002 Grammy Award for Best Rap Performance by a Duo or Group. Killer Mike also was featured on the song, gaining some exposure among areas outside of his native Atlanta. The other two new songs were called "Funkin' Around" and "Movin' Cool (The After Party)"
The same year OutKast participated in the only Dungeon Family group album, Even in Darkness, along with Goodie Mob, Killer Mike, Sleepy Brown, Witchdoctor, and Backbone among others, and featuring Bubba Sparxxx, Shuga Luv and Mello. In 2002, the group and Killer Mike contributed the lead single "Land of a Million Drums" to the Scooby Doo soundtrack. In September 2003, OutKast released a double album, Speakerboxxx/The Love Below. It is essentially two solo albums, one by each member, packaged as a single release under the OutKast banner; the two members also appear on each others' discs for a few songs apiece. Big Boi's Speakerboxxx is largely a funk and Dirty South blended party record; Andr? 3000's The Love Below features only brief instances of hip hop, presenting instead elements found in funk, jazz, rock, electronic music, and R&B. The album is also OutKast's biggest commercial success yet, having debuted on the Billboard 200 albums chart at number-one and stayed there for several weeks. The album eventually sold over five million copies, and, as double-album sales count double for Recording Industry Association of America certification, the album was certified diamond for 10 million units shipped in December 2004. Its latest certification, in May 2006, reaches 11 million copies in shipping. The first two singles from the album(s), which were released nearly simultaneously, were Big Boi's "The Way You Move" and Andr? 3000's "Hey Ya!" The video for "Hey Ya!" is based on The Beatles' landmark appearance on The Ed Sullivan Show. The video's storyline has "The Love Below"?a fictional band with all members, through the use of special effects, played by Andr? ?performing in London. "Hey Ya!" was the number one song on the very final weekend of American Top 40 with Casey Kasem. It was also number one a week later on the very first weekend of American Top 40 with Ryan Seacrest. The singles spent ten weeks at number one on the Hot 100 singles chart, with "Hey Ya!" spending nineteen weeks and "The Way You Move" briefly taking over in February 2004. These singles were seen as a breakthrough for the hip-hop industry, being among the first hip-hop songs to be widely played on adult contemporary radio stations. OutKast's next official single was not released until the summer of 2004. "Roses", a track featuring both members from The Love Below half of the album, did not meet the level of success as either of its predecessors, but it became a modest-sized hit on urban radio and the American music video networks. The video for "Roses" is loosely based on the musical West Side Story and Grease. It featured sparring 1950s-style gangs, one representing Speakerboxxx, and one representing The Love Below, parodying the widespread arguing among critics and fans as to which half of the album was better and that the two members were estranged. The final singles were Andr? 3000's "Prototype", which was paired with a science fiction-themed video about alien visitors, and Speakerboxxx's "Ghettomusick," which featured both members of OutKast and a sample from a song by Patti LaBelle, who also makes an appearance in the video. Speakerboxxx/The Love Below won the Grammy Award for the 2004 Album of the Year, becoming only the second rap album to ever receive the honor (the first being The Miseducation of Lauryn Hill by Lauryn Hill in 1999). OutKast was one of the headlining acts at the show, and gave two performances: Big Boi performed "The Way You Move" during a medley with George Clinton & P-Funk and Robert Randolph and the Family Band, while Andr? 3000 performed "Hey Ya!" as the show closed. In February 2004, Andr? 3000's performance, which featured female dancers moving wildly around a green teepee in war paint and feathered headdresses, was criticized by the Native American Cultural Center, who called for a boycott of OutKast, Arista Records, NARAS, and of CBS, the broadcaster of the awards show. CBS later apologized. Between OutKast albums, Big Boi and Andr? 3000 ventured into film projects. Andr? co-starred in John Singleton's action film Four Brothers and also had a part in Be Cool, while Big Boi took a featured role in the T.I. movie ATL. Both members also began working on a joint film, Idlewild, directed by OutKast music video director Bryan Barber. Idlewild, a Prohibition-era musical film set to a blues-influenced hip-hop soundtrack, was released on August 25, 2006 by Universal Pictures. The Idlewild soundtrack was released August 22, 2006. Its lead single, "Mighty 'O'", features both OutKast members, and was briefly played exclusively on local Atlanta radio stations before being issued as a single in May 2006. They released and shot the video for "Morris Brown" instead. A video for "Idlewild Blue (Don'tchu Worry About Me)" soon followed. Aquemini Records folded in 2004, and Big Boi founded a new record label, Purple Ribbon Entertainment, to be distributed by Virgin Records. Among its first signees were Sleepy Brown, Bubba Sparxxx, and Killer Mike, Big Boi has released a group album/compilation, titled Big Boi Presents... The Purple Ribbon All-Stars - Got Purp? Vol. 2. One album remains on the band's LaFace contract. It was originally planned as a ten-track release called 10 The Hard Way; shortly after Idlewild was released, the duo confirmed the album is still in the works, though both have begun new projects without releasing any new information on the album. Due to both Big Boi and Andr? 's interest in separate projects such as movies, TV (Andr? 's Class of 3000) and solo albums, rumors of a split have turned up frequently in the media. Andr? denied those rumors in a phone interview with MTV News, stating that even though they do not feel like performing on stage together, OutKast is "still tight". In an August, 2006, interview with UK journalist Craig McLean, after emphasizing that they would not split, the pair looked beyond music and film careers, Big Boi suggesting he may consider running for the job of Mayor of Atlanta in the future. 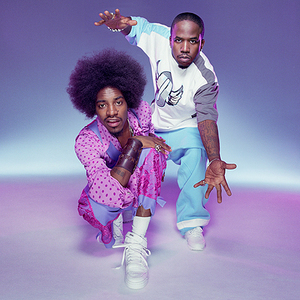 In 2007, Andre 3000 confirmed a new OutKast album would be released, but said that he and Big Boi released solo records first, stating the group album is still possibly two years away. Big Boi's solo album will be released first in June/July of 2009, with the first single, "Royal Flush" (also featuring Andre 3000, essentially making it an OutKast song), planned to have been released on December 31, 2007, but was not released on the announced date. Big Boi announced on his MySpace that the release date for Sir Luscious Left Foot: The Son of Chico Dusty is now sometime in the summer of 2009. On Nov 14, 2008, the Guardian reported that OutKast will release their follow-up to Idlewild in 2009 after Big Boi and Andre 3000 release their solo albums in the same year. As of August 2009, the albums have not yet been released.